Rooted in the science of the brain, and integrating cognitive neuroscience and child development, Mindful Parenting is a unique program that speaks directly to today's busy families who make up what Dr. Race calls "Generation Stress." Research has shown that mindfulness practices stimulate the prefrontal cortex of the brain. Regular stimulation of this part of the brain helps us feel happier, healthier, calmer, less anxious, less stressed, and makes it easier for us to concentrate and think clearly—the very behavior we are hoping our children will display. Mindful Parenting understands the realities of raising a family in our fast paced and often-frenetic world and provides hundreds of easy-to-implement solutions, both for parents and their children, to help them manage stress, create peace, and live happier lives. 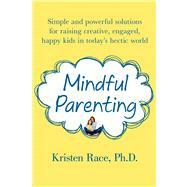 KRISTEN RACE, Ph.D. is an expert in child, family and school psychology and the founder of Mindful Life. Dr. Race speaks regularly at national conferences and for many community groups. Her print articles have appeared in Kiwi magazine, Denver Life, and Colorado Business Magazine among others, and she has appeared on the CBS Morning Show and Everyday Colorado as a parenting expert. She currently resides in Steamboat Springs, Colorado with her family.